If you’ve already managed to learn a little bit about the treatment and have taken our guidance in finding a great laser hair removal clinic in London, the next step is likely to be the consultation. Booking a consultation in advance of the treatment is usually a required and typically free. The consultation allows the clinic to best assess your needs and make sure that you are suitable to have laser hair removal treatments. For you, it’s a chance to see the clinic, meet the therapists and ask any other questions before making any final decision. So, in light of this, this week’s blog article focuses on some ‘must-ask’ questions that you can put towards your practitioner when you get to the consultation. Can I have Laser Hair Removal treatment? Perhaps the most obvious and critical question is whether your skin and or hair type is suitable. With advanced technology most people can have laser hair removal however there are some instances where laser hair removal treatment is not recommended. For example, white hair with no melanin cannot be targeted by any laser and therefore is not suitable to be removed via the laser hair removal process. Within the consultation process a free patch test is offered where we expose a small area of your skin to laser light. This also helps to calibrate the machine so that we can achieve the very best results bespoke to your skin and hair. It may be that you need laser hair removal for darker skin, again at Premier Laser we have invested in state-of-the-art technology so we can accommodate a variety of skin and hair colour and types. Laser hair removal can cost from £44 to £3000 depending on which provider you choose, the area of treatment and how many sessions you’re planning to undertake. For example, if you have laser hair removal for your earlobes, nose or eyebrows it can cost as little as £44 for a session. If you want a full body (top to toe) package, then it can cost £2140 with our current special offers. Be sure to take a look at our laser hair removal pricing page for all of our latest costs. What Laser Hair Removal technology / machines do you use? Finding out what technology clinics use will give you a good indication about the quality of the clinic. If a clinic has a wide variety of lasers and regularly keep them up to date, it shows that they care about delivering the very best customer care, comfort and results. If the clinic is using a machine that is relatively old and unfavourably reviewed online, it may be a warning sign to look elsewhere. London Premier Laser regularly invests in the very best technology to ensure client comfort and results. You can take a look at our advanced laser hair removal technology online. As mentioned before, we always undertake a patch test to check for any potential side effects or reactions to the laser. No clinic will claim that laser hair removal is totally pain free and without side effects. Some customers do experience slightly reddened skin after treatment, but this usually subsides very quickly within a few hours. The pain of treatment has been likened to a rubber band ‘ping’ and is deemed much more painless than alternative hair removal options such as waxing. How many Laser Hair Removal treatments am I likely to need? Some customers may require multiple treatments before they see full results, some may require fewer. It all depends on your skin, hair, technology and area of the body. That’s why it’s important to always get an estimate after your patch test so that you can at least have a realistic expectation of the results. Typically the average person will require around 6-8 sessions for the full effects however hair reduction is noted even after the first session. Laser hair removal process uses multiple sessions as it’s important to catch all the hairs at the correct stage of the hair growth cycle. Even if you have a consultation booked elsewhere and just want some guidance, always feel free to get in touch with our team. We have over a decade of experience, the very latest technology and are incredibly competitive with pricing. Contact us online, by phone or in clinic today. Skin stripping is a common expression used to describe unintentionally harming and damaging your skin by using the wrong beauty or health products. If you use the wrong product (or too much of it! ), you could strip away all the natural oils that protect your skin and keep it healthy. For many years plenty of us have wrongly believed that oily skin is something to be avoided at all costs and can lead to things like acne and blemishes. However, it is these natural oils that actually keep the safe in good condition and protect the all-important skin cells beneath. It is one of the reasons that medical professionals always advise against new parents from using anything other than water to wash their new-borns skin. Removing the natural oils could permanently damage their baby’s skin in the long term. Whilst we all get older and our skin is exposed to more elements, the advice remains the same. How do I recognise skin stripping? If you’ve just used a product and feel like that your skin is tight, the chances are that you’ve stripped your face entirely of all those precious oils. Whilst you might mistake the tightness for suppleness, this is likely to be caused by simply drying your skin entirely. In most cases, skin stripping is caused by either using wrong products for your skin or over-use of the right products. Items such as face wipes, cleansing products and skincare foam washes not only remove the natural oils found on your skin, but also potentially do some damage to the skin below. Whilst the short-term effect may be exactly what you wanted (dryer, smoother and the appearance of cleaner skin), the long term effects could be a lot worse. Make-up wet wipes are by far the worst example of skin stripping. Harsher chemicals may be added to help remove all of the make-up content from your face. So, whilst you may be happy with the results of a strong make-up remover, it could also be removing important elements of your skin. However, sleeping in make-up can also be damaging to your skin as it can block the pore that help produce that much needed natural oils. Another potential cause of skin stripping could be by showering too much! Assistant clinical professor of dermatology at UCLA, Dr. Carolyn Goh, has said that “staying in [the shower] too long washes the oils away from your skin”. So next time you have an acne breakout, you might want to think twice about doing to many face washes! What are the effects of skin stripping? Above all else, skin stripping removes your natural oils. These oils form a protective barrier against bacteria and other harmful elements that could not only damage your skin, but harm other body parts. Removal of these essential oils can also cause dryness and potentially redness of the skin. If your skin isn’t properly hydrated, this can lead to cell degradation and even potentially peeling if the skin area and cells are dying. Dry, flaky and dead skin rarely feature in your beauty regime! However, it’s not just the appearance that can be harmed. Every time you lose those skin cells, you’re also losing valuable protection against the sun. Your skin acts as a natural barrier for the rest of your body and helps reduce the amount of UV rays that are absorbed. Something like IPL Skin Rejuvenation can be a better option than using the wrong or too much skincare product. IPL uses “Intense Pulsed Light” to target damaged skin areas and helps regenerate collagen, tighten and firm the skin and diffuses redness. It can also be used for dispelling broken veins, reducing fine lines, improving Rosacea and reducing the impact of sun/age spots and birthmarks. You’re always welcome to speak to our team, either in one of our London clinics or over the phone, to find out more about how it works and whether it would be suitable for you. For many of our thousands of patients, the biggest worry they have when they first learn about our laser hair removal treatment is the word “laser”. It brings with it connotations of super-hot and killer laser beams that can cut through metal in an instance. For many, this creates the perception that it’s unsafe, it’s super sore and it’s totally uncontrolled and scary. This couldn’t be further from the truth. In fact, laser hair removal uses an incredibly focussed and incredibly controlled laser emission to target only the hair follicles and hair that you want to remove. The sophisticated technology ensures that the surrounding skin isn’t targeted and remains entirely safe and unaffected. We take a number of precautionary steps to ensure that you’re suitable for laser hair removal treatment (not everybody is) and that we can provide the right recommendation that will yield you the greatest results. Our free and no-obligation consultations ensure that you have all the information you need and that we can deliver a tailor-made recommendation that meets your expectations and protects your skin. To ensure that the procedure will be successful (and you’re not wasting your money) we provide a free patch test for would-be laser hair removal patients, much similar to a hair colour patch test, we expose a small area of skin to ensure there is no adverse reaction. After a consultation, we expose a small area of your skin to the laser to ensure that there are no adverse reactions and that it’s safe for us to proceed with the treatment. This also allows us to properly calibrate the laser technology to your skin, so we can ensure the best comfort and results possible. Laser hair removal technology has been around for nearly 60 years. In that time, the technology has improved and changed to produce better results with the safest methods. At Premier Laser we’re committed to patient safety by ensuring that we use the very latest and safest technology to get you the very best results. Not only do we use the very best laser hair removal technology in London, but we use a variety of machines, at a greater expense to our business, to ensure that we can offer the same services to patients with darker skin or fairer hair colour. The Premier Laser team is compromised of experienced aesthetics experts who have received specific training to help them do the very best job possible. We put all of our nurses, technicians and staff through rigours training to ensure they are well equipped on our technology and the very latest and safest methods. Furthermore, we ensure that they receive regular training as part of a refresher programme to keep them up to date on all the latest developments, technology and practices in the industry. As part of our operations team, we ensure the safety of our patients by undertaking gruelling safety and maintenance checks across our team and technology. By ensuring that our equipment is always in the best condition, always well maintained and our working environment is as clean and safe as possible, we can help reduce the risk of any complications or poor results. As the Christmas period looms just a few weeks ahead, the chances are that many of us will be trying every trick in the book to beautify and perfect our appearance for highly anticipated Christmas parties and events. Whether you want to look your best at the office Christmas doo or want to wow your friends back home, it’s time to think carefully about your skincare regime now so that you’re not caught out. Here’s a look at some of the potential things that you might be doing wrong in your quest for better looking skin but ultimately may be harming your skincare routine in the long run. For many men and women, waxing is the most obvious way to remove hair quickly and achieve a smooth silky looking skin. However, waxing can lead to a number of issues for your body that can affect your health and comfort. For example, a Brazilian wax to the bikini area could increase the risk of infection. Noted dermatologist – Dr. Krant – has stated that “pulling the hairs out of those areas increases the risk that tiny skin tears will get bacteria in them that was never meant to be inside the skin. It can cause surface infections and even deeper cellulitis in some cases.” It’s one of the reasons why we recommend Laser Hair Removal as a less painful option for getting rid of large areas of hair. For all of us shaving can quickly become a timely and annoying task. The Dermal Institute have estimated that the average man can spend 6 months of his life just shaving his beard such is the inconvenience, so we can’t imagine how much time is spent on everywhere else! Perhaps the cheapest and fastest way to remove unwanted hair, shaving carries with it a number of potential dangers to your skin. For the first part, many shaving products and the razor itself can remove the natural oils and barriers that protect your skin from harmful bacteria. Shaving with a blunt blade or incorrectly can lead to razor bumps or ingrown hairs, which can in turn, become inflamed and even infected, leaving you red-faced and uncomfortable. We’ve all been there – a breakout of bad acne and you desperately try to get rid of it by plastering your face with as many products as you can! Likewise, just as you go out partying over Christmas, you may be wearing make-up more than usual and as such, need to remove it more regularly with make-up wipes. However, using these products can often strip the skin of valuable natural oils that help protect the skin and keep it looking firm, plush and healthy. In some cases, too much usage of a skin product can lead to irritation, block pores and even the odd horrible infection. Whilst natural oils for your skin are much needed, simply using a “natural” product doesn’t necessarily make it good for you. Leading dermatologist, Dr. Allison Arthur, has commented that “another natural product I see being used a lot is coconut oil. Using that as a moisturizer in areas like the arms and the legs is typically fine, but I don’t recommend using it on the face because it can clog pores and make acne worse”. Mixing too much with other products could also lead to allergic reactions that could do more damage than good. Likewise, many people may take the obvious approach of constantly washing their face in the hope that it will clear up the acne. In fact, too much showering or scrubbing can remove those natural oils as well! This can leave you with dry and irritated skin that is lacking a protective barrier. Furthermore, if you’re washing too frequently, your body may respond by overproducing oil for the skin later on – which can lead to blocked pores and an overly oily skin. Your new little bundle of joy has finally arrived. Not only are you sleep deprived, frazzled, and down to your last possible nerve, but you also have yet another problem thanks to that beautiful baby – mummy tummy. Lots of new mums suffer from that frustrating, sagging loose skin filled with stretch marks after the baby arrives. After all, your body had to gain at least fifteen pounds over the course of nine months, and that can be difficult on your skin. What can you do to fight the results? Sure, you could spend hours in the gym doing crunches, but the reality is that wont always help the loose skin. ULTRAcel is one of the best options we have available to help you fight that mummy tummy. ULTRAcel offers three treatments in one. The first is a high intensity focused ultrasound. That helps to target the SMAS skin layer, then create thermal wounds, which pushes your body to begin a healing process that involves tightening and lifting the skin. Part two is Grid Fractional Radio Frequency, or GFR for short. It applies heat to the dermis and epidermis, which can smooth the collagen and create new collagen. Fractional Radiofrequency Microneedling is part three. It uses microneedling and radiofrequency to help create the collagen production your body really needs now to heal those stretch marks. Not sure Ultracel will work for you? We also offer a couple of other great choices as well. Ultraformer HIFU – This is a high intensity focused ultrasound tool that is both simple and non-invasive. The applicator is simply placed on the area you’d like to tighten, then the energy targets the lowest layers of the dermis, which generates heat. That can push the collagen production, which rejuvenates the problem areas. After a single treatment, that mummy tummy will have almost completely disappeared. Radiofrequency Microneedling – If you’re concerned about the stretch marks you still see, this is perhaps the best way to deal with them. Using a series of tiny needles, the skin is penetrating, which leads to the added collagen your skin needs to repair those stretch marks. The treatment time is quick, which makes it the perfect option if you’re looking to get in and get back to baby sooner. Surgery doesn’t have to be your only option after the baby arrives. Instead, you can use one of these treatments to help you deal with the saggy, loose skin and stretch marks. Contact us today to learn more. You notice them every time you look in the mirror – they’re dark spots that just never seem to go away. A quick online search to learn more about what they are is likely to reveal two terms with which you may not be familiar – hyperpigmentation and melasma. What are these conditions, and which one are you fighting right now? Hyperpigmentation is a fairly common skin condition. It affects millions of people across the globe each year. It’s completely harmless, but you’ll typically notice it right off. Patches of your skin become darker than normal in colour. It happens when too much melanin, a brown pigment that is typical in your body, creates as small deposit under the surface of the skin. The result is those uneven patches you notice in the mirror. Hyperpigmentation comes in many different varieties, and melasma is one of those. Sometimes called chloasma spots, melasma involves large areas of darkened skin. It’s usually a direct result of hormonal changes. Pregnant women often notice them, as do women who are on birth control. Melasma patches can appear almost anywhere. Most people develop them on their cheeks, across their noses, on their chins, or on their upper lips. These patches might also appear on the forearms or the neck. Whether you’re suffering with melasma or another form of hyperpigmentation, you don’t have to deal with the discolouration. You do have options. Your best first option is to use better protection every time you head out into the sun. The sun will only make those discolourations appear darker. Choose a broad spectrum sunscreen, and reapply frequently if you plan to be in the sun for some time. Beyond that, though, you can even your skin tone with two of our top treatments – our Cosmelan Peel or our Laser Pigmentation Removal service. Cosmelan is the leading depigmentation peel. It works to even out your skintone and remove all pigmentation. The treatment has an efficiency rate of up to 95% when treating pigmentation and dark spots. Laser pigmentation removal uses wavelengths of light that shatters the discolouration and uses the body’s lymphatic system to remove them. You’ll see results within just a few sessions, and there are very few side effects. Stop staring at those spots in the mirror and do something about them! Book with us today. Fillers are injectables that you can use to do more than just smooth wrinkles. You can fill out a jawline, giving yourself a more striking look. You can broaden and even out your lips so you feel less self-conscious about your smile. You can treat dark circles under your eyes, an unhealthy look that plagues many. And if you do want to smooth your wrinkles out, you can utilise Anti-Wrinkle Injections to ease them away. 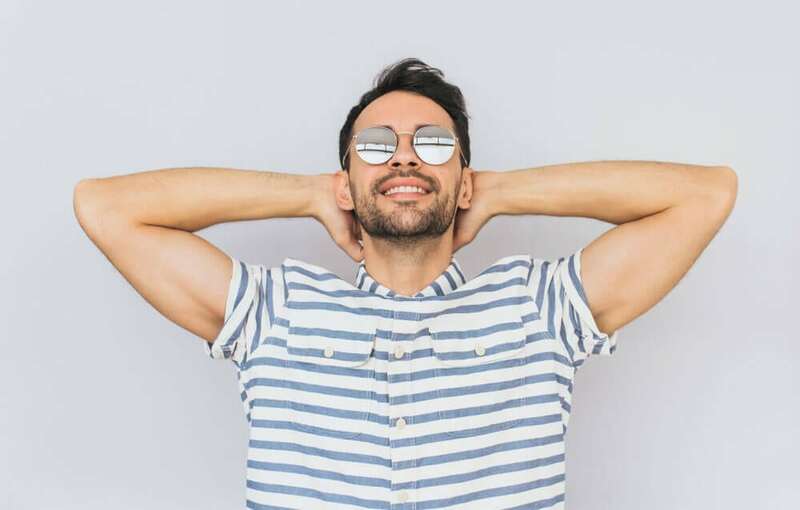 Having a defined and chiselled jawline is an aesthetic feature that many men are after, and lucky for you this is now achievable with Jawline Filler. Jawline filler can be used to make the jaw more pronounced or consistent, whether clean-shaven, with a bit of stubble, or to complement a handsome beard. Whether you’re looking to add more volume to your chin, or you want a more defined angle in your jaw, our Aesthetic Nurse & Doctor can help you get the look you want. Lips are the first place the eye goes when someone is speaking, or when someone is considering kissing someone else. They say a lot about what happens next. Sometimes, men struggle with asymmetrical lips. These can be evened out in a way that’s gradual and natural in appearance. There’s no harm in making another’s eyes linger. Bags or dark circles under the eyes can be addressed with fillers. These fill out areas that look sunken or diminished. This can be important in encouraging others to meet your own gaze, whether you need a boss to listen more carefully to you, or to feel more confident on a date. Eyes can be more expressive the more someone else is able to focus on them. This is a proved method to reduce wrinkles. Many men don’t want to completely eliminate age lines that communicate wisdom and experience, but they may want to reduce them so they are less pronounced. An Anti-Wrinkle IInjectionsplan can be modified for the precise amount of effect you want it to have. This allows you to get the exact look you’re going for, experienced enough to know what you’re doing, but still youthful and energetic. Call us today to find out more about our Injectable treatments for men! How Do Injectables for Excessive Sweating Work? You have roughly three million sweat glands, and they’re across your body – in your armpits, around your groin, and even on the soles of your feet. Sweat is absolutely necessary to human life. It helps to cool your body on the hottest of days. It means you won’t overheat quite as quickly when you workout. It can also mean you detoxify your body and send salt back into your blood stream. What happens, though, when you don’t sweat like you should? What happens when sweat goes into overdrive? While some sweat is normal, if you’re sweating too much and it’s not related to the heat or any physical activity you’re doing, you may suffer from hyperhidrosis. It may pop up as you’re chatting with your boss about a new idea you had. It could appear as you’re getting ready to go out for the evening. Either way, it can cause both discomfort and social anxiety, and finding the right treatment is a must. Many people who deal with hyperhidrosis on a regular basis turn to antiperspirants initially to deal with the problem. Today, there are many prescription-strength versions on the market today that can help, but in most cases, the sweat is just too much for an antiperspirant to handle, and other treatments are absolutely key. Anti-Wrinkle Injections for Hyperhidrosis (excessive sweating) help to temporarily block the sweat glands in the targeted area which in turns stops them from sweating. The injections do not cause any harm to the body, and the results can last up to 9 months – making it the perfect summer treatment! The most common areas which people opt to have injections for excessive sweating is in their hands, feet and underarms. Interested in learning more about Anti-Wrinkle Injections to help you deal with your excessive sweating? Contact us today to book your appointment. Dehydrated skin can be difficult to manage. It’s particularly frustrating when it changes your appearance, or makes you look a bit sickly. It’s one of the hardest traits to cover up because it doesn’t just arise from a surface blemish, but from the very condition of your skin. Your body can only use what you take into it. If you’re always thirsty, you’re always dehydrated. Dehydration doesn’t just occur when you have so little water your life is threatened. It also includes those who simply don’t drink enough water on a regular basis. This can have both short- and long-term health effects. Keeping hydrated will allow your body to keep your skin more hydrated. The benefits don’t just stop there. Developing a good habit of keeping hydrated can also improve your breath, ease cramps, reduce fever and chills, help you control your appetite, improve your immune system, and reduce the frequency of headaches. This said, many people who drink plenty of water still struggle with dry skin and dry scalp. This can come down to genetics, but there are treatments that can help. HydraFacial is a non-invasive treatment that is actually very comfortable and soothing. It can be superior in many ways to certain alternatives because you can see the result immediately. You don’t need to wait for anything to take hold or wear off. The process refreshes skin, and it’s especially useful for skin that’s dehydrated, oily, or both. A HydraFacial cleanses your skin and exfoliates it. Bits of dirt, grime, and grit are extracted, avoiding further damage to your skin that they can cause. Your skin is also hydrated and provided antioxidant protection. One of the biggest benefits is that this can hydrate your skin and tone it while still maintaining its elasticity. “Acid” can be a frightening word. Some acids can dissolve metal, whereas eggs, meat, and nuts contain acids that are quite safe to digest. Acids cover a wide range of possibility. Hyaluronic acid is a gentle acid that includes a humectant, or a moisture-binding ingredient. Hyaluronic acid is a popular ingredient for many skincare products including serums and moisturisers. Hyarluonic acid is an all rounder ingredient, and can really help if your skin is dehydrated. At Premier Laser & Skin, we have an extensive range of skincare brands, some of which include amazing products containing this superstar ingredient. To find out more about our product ranges, pop by one of our clinics today!